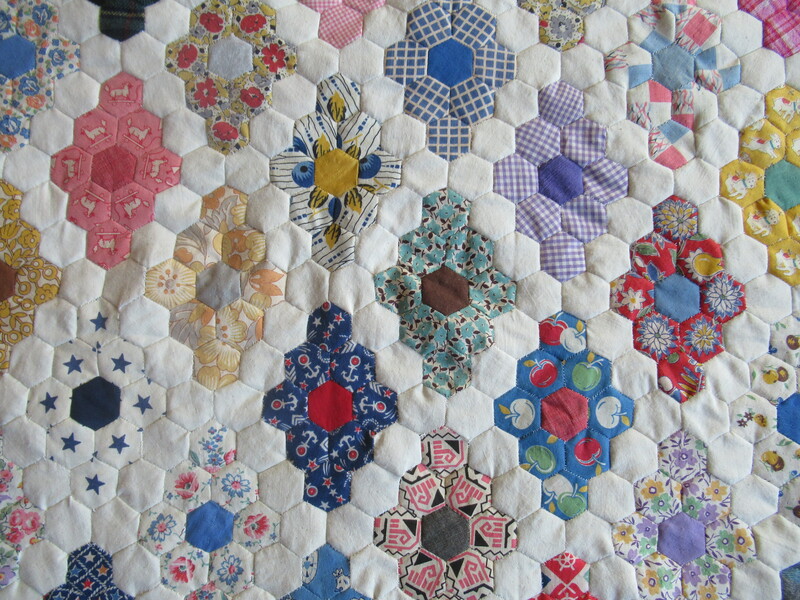 When I was a teenager my grandmother taught me how to do English Paper Piecing quilts. It was a very special time. She pulled out a box and as she showed me its contents, she told me about it. It was full of paper pieced diamonds, made from 1-inch hexagons. She told me that all these diamonds were made by my great-grandmother (her mother) and herself out of scraps of fabric from dresses, shirts, and aprons they had made for their families. She held up one for me to see, “this was my dress when I was a little girl.” She held up another, “I remember my mother cooking in this apron.” And another “This was from a little pinafore I made for your mother when she was three.” And another, “This is from a shirt I made my husband before he shipped out with the Navy.” Oh, such memories! And what a treasure that box held. That is not a thing you can buy in a store. 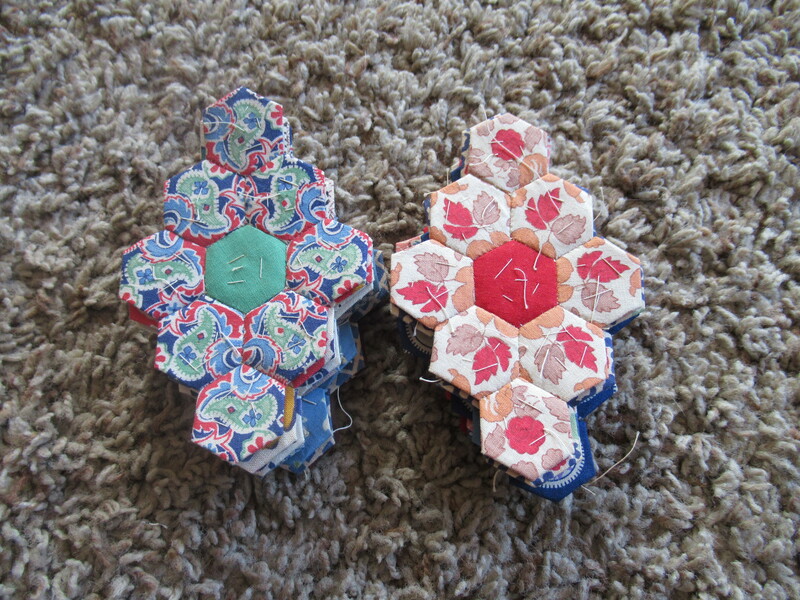 After sharing with me the special memories the box held, she began to teach me how to make the hexagon paper pieces, how to hook the hexagons together into diamonds, and then how to put those diamonds into a quilt or wall hanging. We worked together to make a family tree wall hanging for her house. She used the diamonds that included fabric from clothing from each person to put together the tree. Some people she didn’t have pieces made from their clothing, so she picked fabric that represented them. Like something with anchors on it for my great-grandfather who worked on a ship, etc. It was such a special and fun time for both of us and I cherish those memories now that she is gone. Before she died she gave me the box with all the many, many pieces left after we had used some to make the wall hanging. I was SO excited to be the receiver of such a special gift. 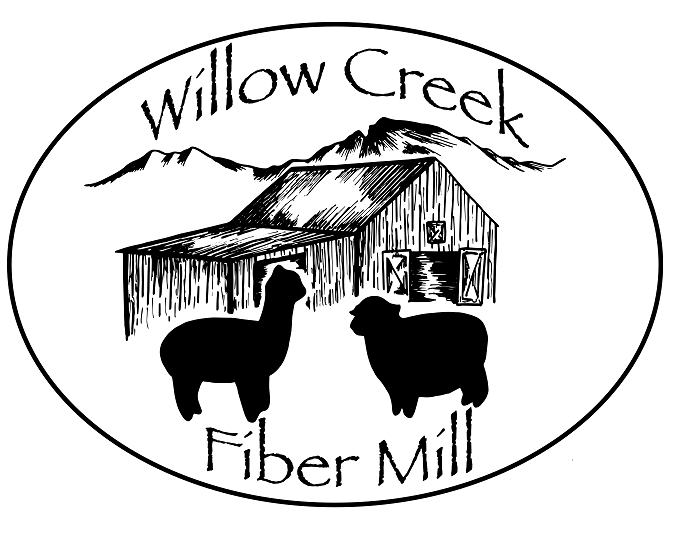 At first it just set in the top of a closet as I was busy juggling many little children, a home, farm, etc. But in the last year or so my daughters and I have been bringing it out and working on it. 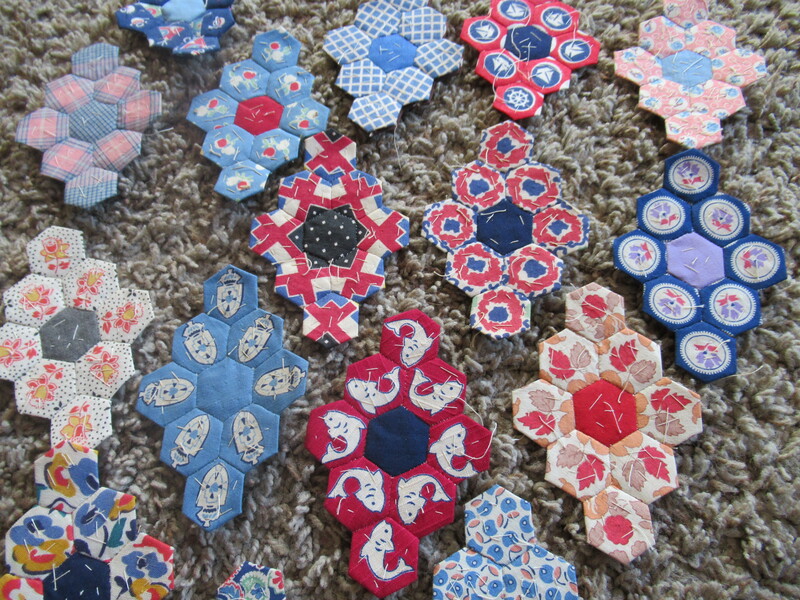 Because it is all hand stitched, and the hexagons are so small, we work on it for a few weeks, then go on to some other craft, and bring it out again in a few months to work on it again. I am sure it will take us years to finish, but what memories we are making along the way! As we work it is amazing to me to realize I am holding in my hand a piece that was hand-stitched by my great-grandmother about 100 years ago! Not only have we been using the pieces made by my great-grandmother and my grandmother, but we have also made our own pieces from fabric from our own homemade dresses, aprons, etc. 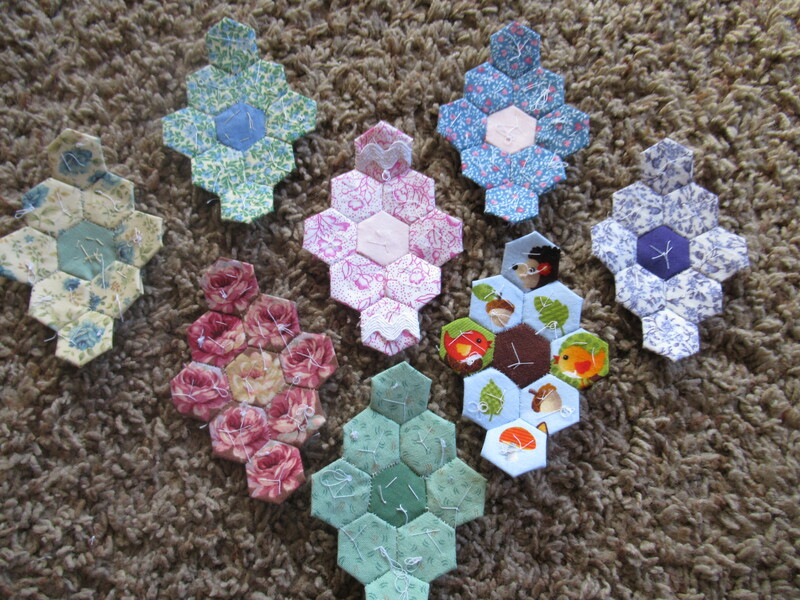 We recently made a piece with the scraps from those bibs I made last fall for Mr. Smiles. So when it is done the quilt will be a 5-generation memory quilt. So special! 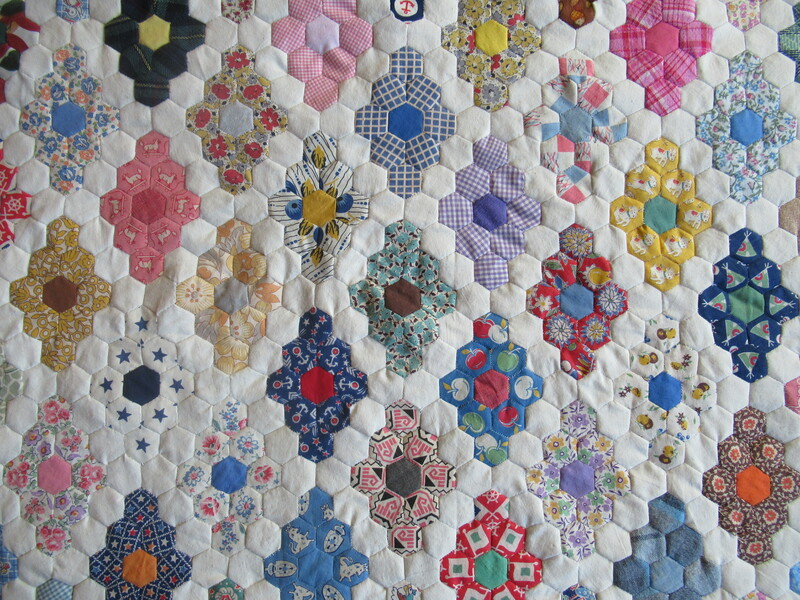 Next week, I will share a post on how to do English Paper Piecing quilts so you can give it a try yourself if you are interested. This entry was posted in English Paper Piecing. Bookmark the permalink. So beautiful! And I love the history.